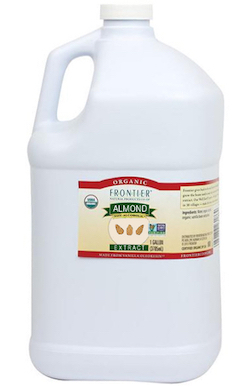 Frontier Natural Products Organic Almond Extract 1 gal. Almond Extract adds a warm, mellow, almond flavor to baked goods and desserts like pies, pastries, turnovers, Bear Claws and croissants. Add the sweet essence of nut to frostings and fillings or even rice pudding or curry. Ingredients: water, organic alcohol, organic glycerin, bitter almond oil.